On August 24, 1941, two months after Germany's invasion of the Soviet Union, Winston Churchill addressed the British people in a live radio broadcast. Describing intelligence reports he had received from occupied Russia, Churchill reported: “Scores of thousands of executions in cold blood are being perpetrated by the German police troops…We are in the presence of a crime without a name.” Although the Polish jurist Raphael Lemkin coined the term “genocide” in 1943 to give these crimes a name, heated debates about the use of the word have continued ever since in response to almost every episode of mass atrocity since World War II. In recent years the most prominent chapter in this debate occurred in response to the violence in Darfur, Sudan in 2003. In July 2004, prompted by pressure from human rights groups and the press, the US House of Representatives passed a resolution declaring that the “the atrocities unfolding in Darfur, Sudan, are genocide,” and in September, the Secretary of State, Colin Powell, officially concurred. In January 2005, however, the UN released its own report on Darfur concluding that, although crimes against humanity had been committed, there was insufficient evidence to support a charge of genocide. The conflicting findings sparked an intense debate. Those in favor of using the term genocide argued that applying this label to Darfur would establish a moral imperative for taking action. Critics, on the other hand, argued that the term obscured the complex reality of the conflict in Sudan—exaggerating the scope of the violence, and distorting its causes and the motives of the government and the rebels. Both sides seemed to agree, however, that the outcome of the debate held the key to American public opinion and, ultimately, to the fate of the people of Darfur. 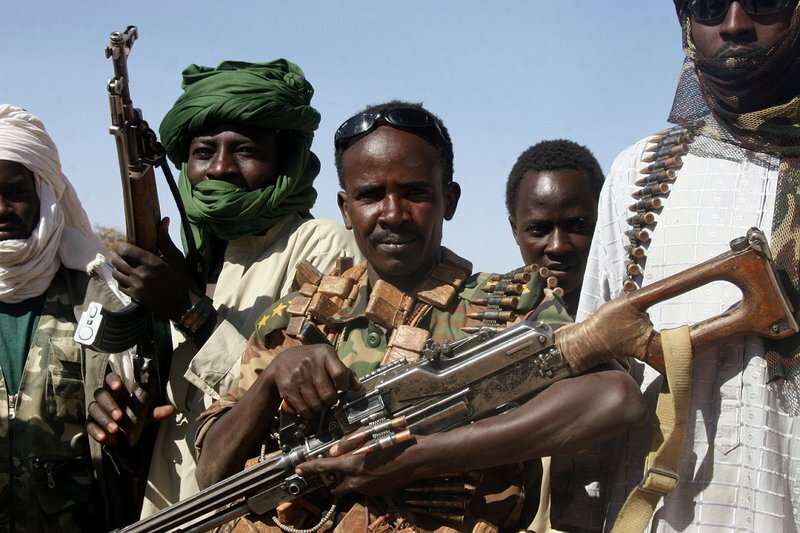 Rebel soldiers assemble in Darfur, Sudan in 2007. Virtually no evidence exists to demonstrate that this word wields the power attributed to it.However, despite the intensity of debates about the genocide label, virtually no evidence exists to demonstrate that this word wields the power that advocates on both sides of these debates attribute to it. To explore this question scientifically, we fielded an original survey experiment on a representative group of American citizens designed to isolate the effect of framing a violent conflict as “genocide” on public attitudes. Three hundred subjects were randomly assigned to one of two groups and each group was asked to read a different version of a fictional news story about a civil conflict in the Democratic Republic of Congo. Each story reported that key public figures—US State Department spokesperson, Robert Wood, and the United Nations Secretary General, Ban Ki Moon—had issued important public statements about the ongoing violence in the country. In order to increase the realism of the experience, the stories were mocked up to look like typical newspaper stories with an Associated Press byline. In each scenario, both Wood and Secretary Ban issued statements deploring the violence in the Congo and calling for a response. In the first scenario, which served as the control group, Wood described a “widespread pattern of violence and killing by the government targeted against civilian populations,” and Ban pointed to “the intentional killing of civilians.” In the second scenario, both Wood and Ban clearly described the situation as constituting “genocide”. Otherwise, the articles were identical. After reading the article, subjects were asked a series of questions about their views on the conflict, including their moral judgments of both sides and their willingness to support various forms of intervention. First, subjects were asked, “Regardless of what the people quoted in the article said, do you personally think the violence in Congo should be called ‘genocide?’” In the control group, 51% of respondents said it “probably” should, while 26% believed it should “definitely” be called genocide. Among respondents who had received the genocide treatment, however, 39% believed that the conflict should “probably” be called genocide, while 41% believed that it “definitely” should be. Thus, the percentage of people willing to “definitely” call the event genocide increased by 15 points—an increase of over 50% relative to the control. 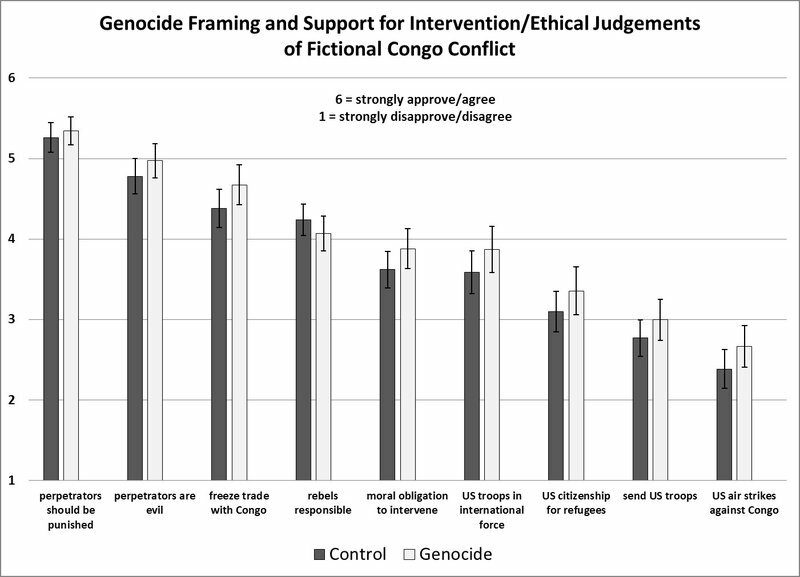 Interestingly, though, despite the increase in the willingness of subjects in the genocide group to label the event genocide, we found little evidence that using the word genocide led subjects to draw different ethical judgments about the conflict or to express different preferences about how the United States should respond. As can be seen in figure 1, the results show that subjects in the genocide condition were slightly more likely to condemn the perpetrators as evil, see the victims as innocent, and support different forms of intervention. However, these effects were very small—never exceeding more than .3 points on a 6 point scale—and never approaching statistical significance at conventional levels. This is not to assert that debates over the use of the term genocide are purely semantic. The use of the term genocide may have important legal implications, especially regarding charges brought in criminal cases against alleged perpetrators. Nonetheless, to the extent that such debates are motivated by concerns that the term’s use is critical in building public support for intervention in humanitarian crises, our results suggest that, on the contrary, these debates are more likely to distract from the substantive discussion about whether and how to stop the killing.